Happy 4th of July, everyone! I hope you are all have some fun and relaxing plans, and hopefully they involve a body of water or some good air conditioning! The humidity in the city this week has been no joke. Halfway around the block with Hads, I looked like I just hopped out of the shower and she looked like was was going to pass out. Needless to say, topknots and light layers have been my bff this week. If you are like me, I always try and take advantage of the massive sales that happen over the holidays. We have a beach trip coming up in August so I thought it would be the perfect time to stock up on a few more bikinis and summer pieces that I have had my eye on. I’ve gathered below some of my favorite sales, would love to hear if any of you find other good finds! Now off to bask in the pool, sip rose, BBQ and watch some fireworks. Happy Independence day! I have been talking about this romper non-stop, but it is such lightweight material and has been marked down 50%, making it $25! I also lowered the clasp a bit so there was more of a neckline to layer up necklaces, etc. Easily done by the tailor (or yourself) and can make a big difference. This one-piece I packed for Italy the other month has gotten so much use. I love the way it looks with a pair of denim cut-offs and sometimes it is nice to have a suit on that you don’t have to constantly be worrying it might fall down. 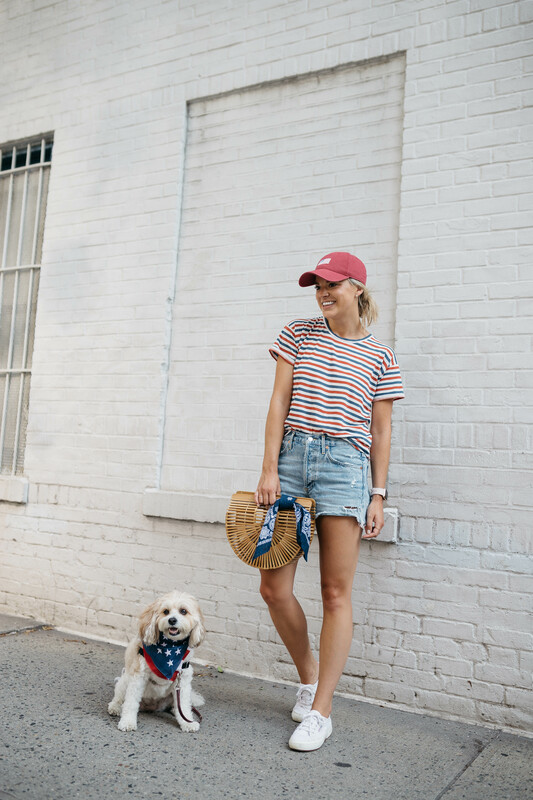 A traditional red, white and blue striped tee, this one may be one of my favorites! These tees are always my go-to, super comfy and can be worn all year long. This one in particular is 20% off with code: SPARKLER as well as this adorable grey one with tiny stars.A lot of you have asked about this hat as well, it is by Harding-lane and can be found here. Abercrombie is basically giving away pieces on their site and it ends today! This long sleeve tee is so comfy and on sale for $12 with an EXTRA 15% off (use code: 11600 for extra 15%). 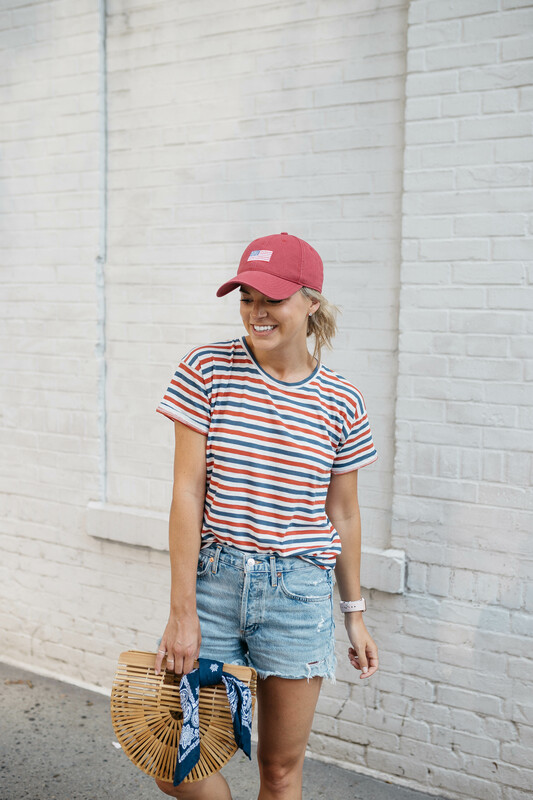 I’m a big fan of their boyfriend tee, it comes in 9 colors and are on sale for $10 with an extra 15% off. Last but not least, this raw hem hoodie I wore on my IG Stories the other day comes in 4 colors, is $19.50 and an extra 15% off! Listing a few more pics in the clickable images below. J.Crew also has some great sales right now. How cute is this summerwight pullover?! It comes in 5 amazing colors and the entire site is currently 30% off with code: ALLSTAR. They have really cute tortoiseshell earrings, a one-piece halter swimsuit I have had my eye on and the field jacket I wear all fall.